The unscheduled visitors barged into the belly of Johannesburg's Soccer City stadium on Sunday night brandishing cold beers and a warm serenade. Cesc Fabregas, Gerard Piqué and Carles Puyol aren't exactly the Three Tenors, but that didn't keep the trio of Spanish soccer players from invading the postgame press conference with a song (of sorts) to hail midfielder Andrés Iniesta after his extra-time goal gave Spain a 1-0 victory over the Netherlands in the World Cup final. "We love you, Andrés!" 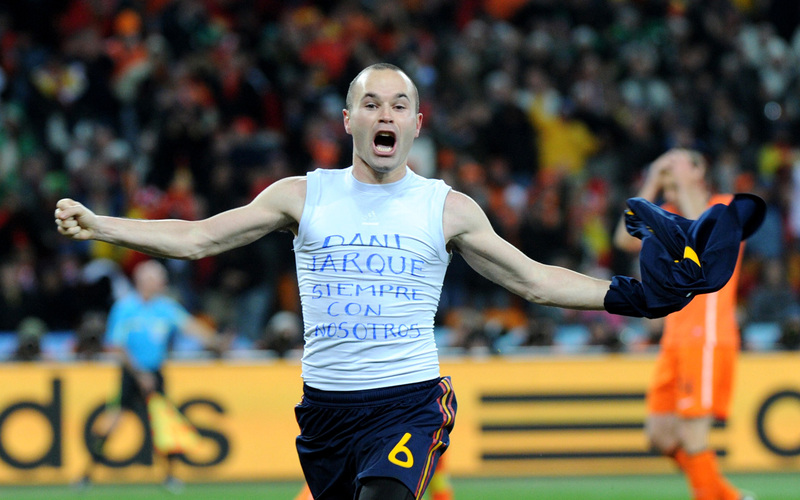 they chanted in Spanish, raising their bottles, dancing a jig and drawing a dimpled smile from Iniesta at the podium. "We're the world champions!" It figures. In a World Cup that saw the sport's top individual stars all exit by the quarterfinals—adiós, Lionel Messi; cheerio, Wayne Rooney; adeus, Kakà and Cristiano Ronaldo—Spain had to turn everything into a team affair. That included the decisive goal. The fate of the 19th World Cup came down to one lovely play in an unlovely final. The defining sequence started when Puyol, a defender, won the ball just seven yards from his own byline, then triggered a breathtaking 25-second, 100-yard buildup that featured five Spanish players, 10 dribbles and six passes (including one gorgeous backheel) before Iniesta fired Fabregas's elegant diagonal feed into the Dutch goal. How LeBron James and Chris Bosh came to join Dwyane Wade in Miami. Not even Rolex produces movement so coordinated and true. "I can't quite believe it yet," said Iniesta, who has a penchant for big-game strikes, having scored an extra-time goal against Chelsea that secured Barcelona's spot in the 2009 Champions League final. "I simply made a small contribution in a game that was very tough, very rough." Iniesta's 116th-minute goal saved everyone from enduring the third penalty-kick shootout in the last five editions of the World Cup final, and if he wasn't right about his small contribution—that was his backheel pass too—he was dead-on when he described the encounter as overly physical. English referee Howard Webb handled the final like a substitute high school teacher, losing control of the game despite issuing 14 yellow cards, eight more than the previous record for soccer's crown jewel. Webb's main failure? Not handing deserved red cards to Dutch midfielders Mark van Bommel (who viciously cleaned out Iniesta with a tackle) and Nigel de Jong (who fly-kicked Xabi Alonso in the chest) in the first half. By swallowing his whistle early on, Webb allowed the nastiness to dominate the final. You could joke that the tone was set when security forces punched and subdued a man who ran onto the field before the game and tried to put a stocking cap over the World Cup trophy, but that would be letting Dutch coach Bert van Marwijk and his thuggish players off the hook. Realizing they couldn't match Spain's skill and possession—a revealing concession considering that the Dutch roster was stocked with elite attackers—the Netherlands tried to rely on quick strikes through midfielders Arjen Robben and Wesley Sneijder while using hardmen De Jong and Van Bommel (the Eddie Haskell of soccer) to throw the smaller Spanish players off their games. It nearly worked. Robben had two second-half breakaways saved by Spanish goalkeeper Iker Casillas, while Iniesta could have drawn his own card for a frustrated retaliation takedown of Van Bommel. In the end we were left to ponder a system in which Iniesta received the same yellow-card punishment for his goal celebration (removing his jersey to reveal a T-shirt honoring the late Spanish league player Dani Jarque) as De Jong and Van Bommel got for their game-shaping acts of cynical aggression. When a Spanish journalist asked Van Marwijk about "the tough, ugly image that Holland has left on the field in this final," the Dutch coach argued that it was the only way his team could prevail. "It's still our intention to play beautiful soccer, but we were also facing a very good opponent," he explained. "Spain is the best soccer country of the past few years, and we really need to have a top day to be able to beat them. Both sides committed fouls. That may be regrettable for a final. It's not our style. But then again, you do play a game to win." Playing to win was the rationale used by more than one traditional powerhouse in this World Cup to justify a retreat from creative, attack-minded soccer—or a full abandonment when facing Spain. Under its taskmaster coach, Dunga, Brazil ditched the Beautiful Game for a counterattacking strategy that relied on power and athleticism more than flair and technique. 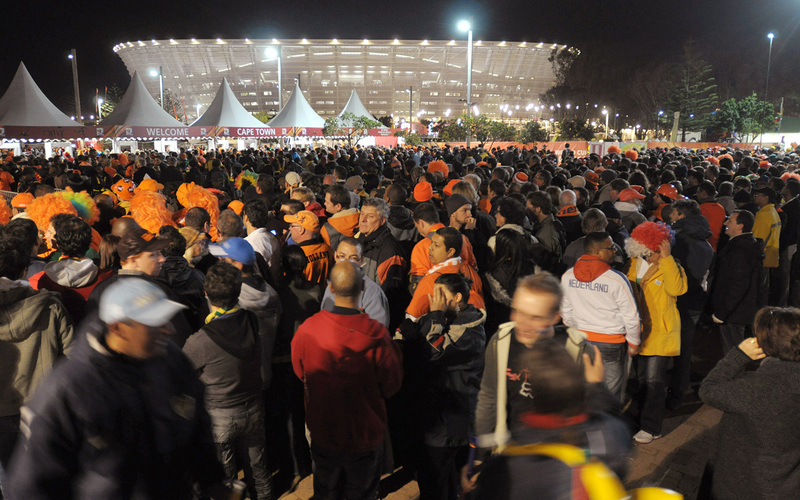 (The Dutch took down the Brazilians 2-1 in the quarterfinals, setting the stage, one hopes, for a return to the style that made Brazil special when it hosts the next World Cup in 2014.) And for all the excitement that surrounded third-place Germany, which scored 11 goals against Argentina, England and Uruguay, the youthful Germans were exposed by Spain in a 1-0 semifinal loss as a team that had precious few ideas other than to mass in their own half and play bunker ball if they couldn't strike on the counter. Spain is special. It has a plan, a constructive style and, after six decades of chronic underachievement, a mystique. If 1998 to 2006 was the era of France's Zinédine Zidane in world soccer, we have now entered the era of La Furia Roja (the Red Fury). By beating the Netherlands, Spain became only the third nation ever to hold the World Cup and European Championship trophies at the same time, joining Franz Beckenbauer's West Germany (Euro 1972 and '74 World Cup) and Zidane's France ('98 World Cup and Euro 2000). But there's more to Spain's accomplishment than winning titles. In fact soccer is only the latest popular global endeavor in which Spain has not only triumphed but has done so by pushing itself to the cutting edge of creativity. Whether the field is haute cuisine (Ferran Adria), cinema (Pedro Almodóvar), architecture (Santiago Calatrava) or fútbol, Spain has advanced to the forefront by refusing to imitate others and instead following the inspiration of a few talented individuals to perfect distinctive aesthetic styles. Tiki-taka—tippy-tap—Spaniards call their possession-oriented soccer attack, a system of short passes, precise triangles and cat-and-mouse keepaway that requires patience, enormous technical skill and the kind of teamwork that comes only from years of playing together. It was no accident that seven of Spain's 11 starters in the final, including midfield maestros Xavi and Iniesta, were teammates at Barcelona, Europe's most successful (and entertaining) club of recent years. By controlling the ball for such long stretches at a time, the Spanish are able to pin back opponents, drain their energy by forcing them to play defense and limit their attacking forays. It's not as simple as it sounds. Opposing teams respond to Spain by packing in their defenses, constricting open spaces and challenging the Spanish to rev their passing rate even higher. Xavi, the ever-scheming 30-year-old playmaker, completed 544 passes (out of 669 attempted) in South Africa, the most by any player at a World Cup since 1966. Granted, not all of those passes were probing forward balls, and Spain was unable to produce as many scoring chances or goals as it did in winning Euro 2008. (Part of that was due to the poor form of star striker Fernando Torres, who was returning from a knee injury and had zero goals in the tournament.) But even though Spain scored only eight goals in this World Cup, the fewest of any winner in the tournament's history, the fact remains that its four 1-0 victories in the knockout rounds (against Portugal, Paraguay, Germany and the Netherlands) were dominant and occasionally dazzling midfield displays. Just as Adria's molecular gastronomy has thrust Spanish cuisine ahead of the staid old French school that used to reign, Spain's World Cup-winning tiki-taka has pushed Brazil, the former gold standard for soccer entertainment, down a few rungs. For many fans in South Africa and elsewhere, Spain has become the new Brazil, everyone's second-favorite team. That was clear in an exchange last week between a Brazilian journalist and the Spanish players at the press conference before the final. "For us Brazilians it's beautiful to watch Spain playing, like we in Brazil used to play years ago, but not now, of course," said the reporter. "Does this Spain team have anything to do with the Brazilian soccer of the past? It's very important for everyone in soccer. Do you think this is the way that one has to play to win? That is, short passes, thinking more, using your brain?" The Spanish players at the podium—Xavi, Casillas and David Villa—smiled, but then Casillas drove home the point: This Spanish team is not trying to copy the past, but rather to chart a new, creative course. "Personally, I think our soccer doesn't really resemble that of Brazilian soccer in terms of anything: the players, our style," Casillas said. "Each side has its virtues, its qualities and its defects. Our style of soccer is, I suppose, inspiring people. In two years to be European champions and to be here in the final of the World Cup, it shows that we're doing things the right way." On Sunday night, after Spain won the most important trophy of all, it was hard to argue with him. But Spain wasn't the only winner during World Cup 2010. Want to win a bar bet? Humble New Zealand, with three ties in as many games, finished as the tournament's only unbeaten team. (Recall that Spain lost its World Cup opener 1-0 to Switzerland.) Uruguay revived ancient memories of its two-time-champion past with its first run to the semifinals since 1970 and the five goals of forward Diego Forlàn, who won the Golden Ball as the tournament's outstanding player. Germany finished third for the second straight World Cup, revealing two emerging stars in 21-year-old midfielder Mesut Ozil and 20-year-old midfielder Thomas Muller, who carried away the Golden Boot award (for the tournament's leading scorer) and the Best Young Player trophy. Also in Germany, an apparently clairvoyant mollusk named Paul the Psychic Octopus became a global sensation by correctly predicting the results of all seven German games as well as the final. Closer to home, soccer in America benefited enormously from the U.S.'s performance, and from ESPN/ABC's blanket coverage. The Yanks won Group C ahead of England before falling to Ghana 2-1 in the round of 16, and the U.S. television audience of 19.4 million for that game (including viewers of Spanish-language Univision) was on par with the World Series and NBA Finals. The Spain-Netherlands final, at 24.3 million, was the most-watched soccer match in U.S. television history. Overall, ESPN/ABC's World Cup ratings were up 31% over 2006 and total viewership up 41%, and the numbers for World Cup 2014 (to which ESPN/ABC also holds the rights) in Brazil figure to be even higher, with games broadcast in prime time. Did soccer in the U.S. reach a tipping point during this World Cup? The World Cup itself did; it is now indisputably a big-time mainstream event in America. But while MLS is expanding, building new stadiums and signing recognizable stars—French striker Thierry Henry was expected to join the New York Red Bulls on Thursday—the U.S. domestic league is still losing money overall and drawing low TV ratings. "I think it's still too early to tell" about a tipping point, says U.S. and Los Angeles Galaxy midfielder Landon Donovan, whose Q rating leaped upward after he scored three goals in this World Cup. "But we've had a very noticeable uptick in attention, support and recognition. I could tell very clearly that people are aware of who we are and what we did. How that translates over time is hard to say. But judging by our Fourth of July [MLS] game [which drew 27,000], I'd say there's a lot of excitement. We'll see how long that lasts and how many new fans we made." For its part South Africa showed that it could stage a giant global sporting event that was well-organized and had none of the major crime or security problems that had been forecast before the World Cup. (The latest word is that Durban, the country's third-largest city, may now bid to host the 2020 or '24 Olympics.) It will be years before anyone can say if the $5 billion spent by the South African government on stadiums, roads and airports was worth it, but throughout the monthlong tournament there was the unmistakable sense that the World Cup had helped unite a nation that is still only 16 years removed from white rule. "We have seen black and white side-by-side at fan parks and stadiums who for many years were prohibited by law from sitting together," said Danny Jordaan, the chair of the World Cup organizing committee. "The demographics at the stadiums really showed football contributed toward nation-building." The same could be said for Spain, a country that has been notoriously fractured over the years by ethnicity (Castilian, Catalan and Basque), to say nothing of soccer allegiance (most notably the rivalry between Real Madrid and Barcelona). As the Spanish tiki-taka'd their way to their first World Cup title, the divisions softened. In the Catalonian capital of Barcelona, World Cup games were shown on big screens in public viewing spaces for the first time. Three players from Real Madrid joined the seven Barcelona representatives in the starting lineup. When Puyol and Xavi cavorted around the field with a Catalan flag after the victory on Sunday, it wasn't viewed as an affront to Spanish society. "Spain the country deserves this triumph, this reward, this World Cup," said Vicente del Bosque, the avuncular Spanish coach. "I think this goes beyond sports. We have been supported by all the people in Spain, and we are delighted to be able to offer this victory to Spain." As the players and fans partied in Johannesburg, raucous fiestas commenced from the Paseo de la Castellana in Madrid to the Plaza de España in Seville to the Plaza Moyua in Bilbao. No matter the location, the Spanish celebrated just as they had won on the field. With style.